Good evening All! I hope you're doing well. How has it gone writing down all of the expenses you can think of? Don't worry about whether or not you've written every single item down that you pay towards each month and year, we'll check those over as we create a budget in this blog. Keep in mind that your budget doesn't necessarily have to be the same each month, so if you think of another category to include, just add it in. Simples. We're still in Baby Step 0. The past couple of weeks we've taken a look at committing to never borrowing money again (except maybe for a house), committing to walking this financial adventure with your spouse and the importance of creating and following a budget. My hope is that you're convinced that a budget is the way you and you're spouse are going to make progress through the Baby Steps. Let's dive right in. 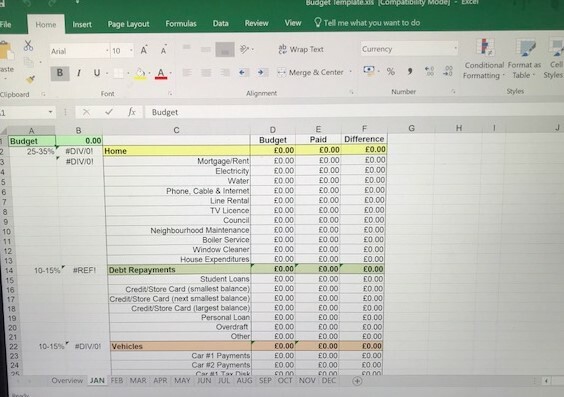 There are many ways of creating a budget: pen and paper, an Excel spreadsheet (this is the way we do it), online and apps. None of these are wrong; use the method you are comfortable and works for you. You may end up trying a different method after you've tried a first! Although I haven't used it myself, others highly recommend using Dave Ramsey's FREE budgeting tool called Every Dollar. This is an easy to use web-based budget planner, but unfortunately, the app is not available in the UK. First - Write down all income streams. This includes your and your spouse's (if you're married) take-home pay - the amount that gets deposited into your bank account. Be sure to add in any second jobs, pension income and benefits. Add it all up. Second - List all of your expenses. Hopefully you've already started this last week, but if not, take the time to look at your bank accounts for deductions, credit card statements for purchases you've made over the past few months and any receipts you've saved for ideas. Again, this doesn't have to be perfect, but needs to be as close to reality as possible. I'll give you more ideas in a sec. Third - Group Expenses. Once you know what your regular expenses are, group them together into categories: Home, Vehicles, Insurance, Giving, Retirement and Other. If you're using an online budget or app, these categories may be named something similar. If you have debt to repay, you'll want to create a category with all of the company's you owe money to and list the minimum payments next to each of these. I'd like to give you more ideas of expenses for each of the categories by giving you insight to our budget. House Expenditures - we save each month for upkeep, small pieces of furniture, decorations, landscaping, lighting - not that we spend towards these things each month! Giving/Tithes: I don't feel comfortable discussing publicly who we donate to, but we do on a monthly basis and this is part of our budget. University Savings: yes, we're saving now for our daughters' education. This comes in BS5, which we'll discuss when we get there in the Baby Steps series. For the items that are annual expenses, I divide the annual amount by 12 (months). and this the monthly amount that is budgeted. For example, MOTs - a MOT for one of our cars is £45. So each month, we budget £3.75. (£45/12 = £3.75). Step 4 - Assign Amounts - For each of your items, list the expense. This may be a real eye opener! Step 5 - Subtract Expenses from Income to Equal Zero - This is known as a "Zero-Based Budget", whereby you want every single penny allocated to each of the items. Subtract the amounts from your income and - voila! - you know how much you either have still to allocate (if the difference is positive) or how much you need to cut back by (if the difference is negative). Ideally you want £0 left... every single penny has a job to do. Step 6 - Track Your Spending - Pretty much every day, I update my budget for anything we've spent that day. It only takes a minute or two and makes me feel a sense of control over my finances. If you have further budgeting questions, please don't hesitate to contact me and I'll do my best to help.